Three bikes came with the Swedish summer house so I figured it was time to pull them out of the shed and clean them up a bit. But not before I took these photos. 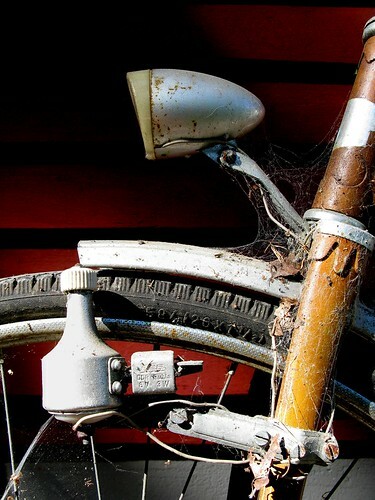 I love rusty bikes and cobwebby bikes. 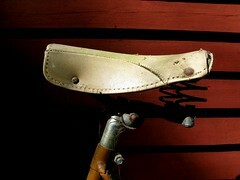 It's amazing how the bicycle retains its aesthetic appeal whether new and shiny or old and rusty. 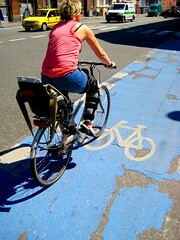 This Copenhagen didn't let her leg cast stop her from getting around. Beats walking. 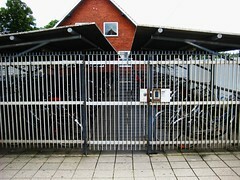 Many stations on the outskirts of the city have loads of bike parking but they also have areas that provide locked bike parking. You get a swipe card for access. Ease of use. 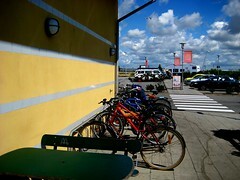 We stopped at a McDonalds on the motorway home from Sweden and I snapped a photo of the bike racks. 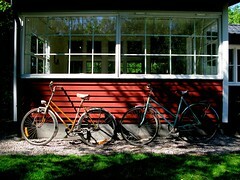 Most McDonalds have bike racks here and in Sweden. This being a motorway restaurant, the bikes are ridden by the employees.